This is Micrathena sagittata, what has got to be one of the most startlingly diabolical spiders in the world. I'm scared! She can be found in the eastern United States and all over Central America, quietly adorning her web as she awaits prey. Her behaviour may well be quiet but her colouration is a kinda loud. 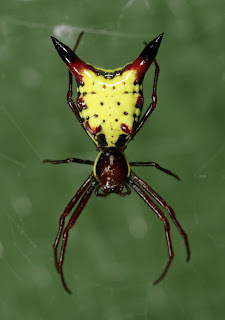 Her abdomen is yellow with black spots and embellished with 6, vicious, red spikes. The 2 big ones on the end are thoroughly blood-curdling! 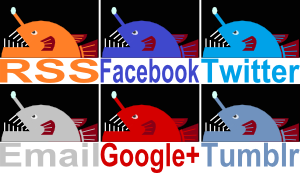 They look like spearheads! They look like bullets! It looks like Satan in a ski-mask! Thankfully, she's only about 1 cm long. The male of the species is about half her size and appears much more humble. These spiders are totally harmless to humans. Still, it looks like she could have your eye out so perhaps it's best not to get too close. Oh, yeh! I forgot to mention that! I was searching online - trying in vein to identify an amazing little spider my son pointed out on the front porch yesterday. Found this post - figured it out. Very cool. Glad I could be of service! It would be terrible to see something so remarkable and never find out anything about it. My son was stung by one of these spiders today. I immediately applied Histergan Ointment and gave him some Piraton and began searching the web for information on this spider that I had never seen before. Thankfully I found this and I am no longer worried. I was terrified that it was poisonous. I'm glad I could give you some peace of mind! They definitely look dramatic enough to make anyone think they must be especially dangerous, but they're not. To be clear, all spiders are venomous since that's how they subdue their prey. A lot of them are too small to get through human skin and very few are potent enough to cause any real trouble to something as big as a human. There's a little more about this species here: http://bugguide.net/node/view/73736/bgimage, where their bite is described as little more than a mosquito bite, so there's nothing to be worried about! Had two of these on my yard on July12,2016. Killed them both. One was two times larger than other, hard to kill.Live in Lakeport Florida. That's a shame that MaryLou killed those 2 spiders. I guess she doesn't know they help keep the insect population down plus this type is completely harmless. I guess since they are scary looking she thought they were poisonous. I have one on the side of our house that I saw today for the very first time in a big bush. I checked it out and then came in and looked it up. That's the best way to find out about spiders really. My son and I have just come across one of these beauties. I've always been fascinated with bugs and spiders and reptiles and all other animals, so seeing a spider which I have never seen before with my 4 year old son was a great experience. Thanks for the information on this spider. We had made him a sort of outside attraction at our house. I found one of these on the outside of one of my windows. Freaked me out! I've never seen such a spider and I am terrified of any of them. I took a pic and started sending it around and no one had ever seen such a thing. I immediately looked it up to see if it was poisonous. And as scared as I am of spiders I did not kill it. I am keeping my distance and letting it be. That's how I am too with spiders. If they are in a web minding their own business, I leave them alone...just keep an eye on them. If I see any on the ground...forget it. Everyone for themselves, lol.